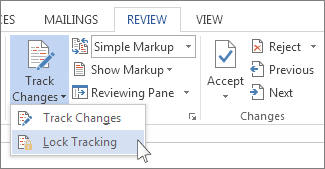 When you want to see who’s been making changes to your document, turn on the Track Changes feature. 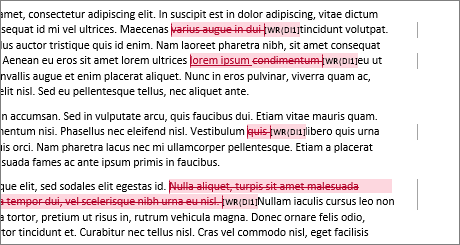 Simple Markup is the default option, and indicates where changes are with a red line in the margin. In the Show Markup list, choose the revisions you'd like to see—Comments, Ink, Insertions and Deletions, Formatting, Balloons, Specific people. You can prevent someone else from turning off Track Changes by turning on Lock Tracking and adding a password. When Tracked Changes is locked, you can't turn off the feature, and you can’t accept or reject the changes. On the Review tab, in the Track Changes list, choose Lock Tracking. In the Lock Tracking dialog box, enter a password, type it again in the Reenter to confirm box, and then choose OK. Note: Adding a password is optional. It's not a security feature. It is intended, however, to discourage others from turning off Track Changes. In the Lock Tracking dialog box, choose Cancel. In the Track Changes list, choose Lock Tracking. If you added a password, enter it when prompted, and then choose OK. Note: Track Changes is still on, but you can accept and reject changes. The only way to remove tracked changes in a document is to accept or reject them. Choosing No Markup in the Display for Review box helps you see what the final document will look like—but it only hides tracked changes temporarily. The changes are not deleted, and they’ll show up again the next time anyone opens the document. To delete the tracked changes permanently, accept or reject them. In the Accept list, choose Accept All Changes. Word either accepts the change or removes it, and then moves to the next change. Word shows a balloon where someone’s made a comment. To see a comment, choose the comment balloon. To see the changes, click the line near the margin. That action switches Word into All Markup view. Choose a comment, and on the Review tab, in the Comments group, choose Delete. On the Review tab, in the Comments group, in the Delete list, choose Delete All Comments in Document.